Kangaroos are the planet's largest marsupials, a variety of mammal in which offspring, called joeys, undergo most of their development inside an exterior pouch on the mother's abdomen. Kangaroos reside exclusively in Australia and nearby islands, including Tasmania. Highly social animals, kangaroos typically live and travel in groups, which are known as mobs or troops. Males of the largest kangaroo species, the red kangaroo, can be up to 6 feet tall and weigh 200 pounds. In all species, females are smaller than males. Male red kangaroos have a maroon-colored coat; female red kangaroos are bluish-gray, which has earned them the nickname "blue flyers." All red kangaroos have a white stripe on each side of their faces. The western gray and eastern gray kangaroo both have silver hair, but the latter's coat is longer and lighter in color. 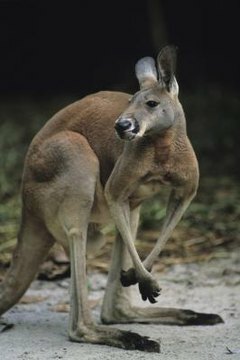 All kangaroos have strong hind legs and conspicuously large feet. They cannot move one leg independently of the other and must therefore get around by hopping. A sturdy tail that ranges from 2.5 to 3.5 feet in length depending on the species helps them maintain their balance while they hop. Red kangaroos inhabit the open areas of the Australian interior, including scrublands and deserts. Their range encompasses most of the continent. Both species of gray kangaroo are found in open woodlands and forests, but after sundown they seek out grassy areas to feed. Eastern gray kangaroos occur in the eastern third of Australia; their western counterparts are found in southern Australia, from the western coast to western Victoria and New South Wales. Kangaroos are herbivorous, which means they only eat plant matter. As grazers, grasses comprise most of their diet, though they will occasionally nibble on shrubs. To avoid the oft intense daytime heat of Australia, kangaroos feed in the morning and evening. A chambered stomach, similar to that of a cow, allows them to regurgitate vegetation, chew it, and swallow it again to complete the digestive process. When food is plentiful, kangaroos feed in groups. Female kangaroos, called does, give birth to one joey at a time after a brief gestation of up to 38 days. The underdeveloped embryo, which is tinier than a cherry and weighs less than an ounce, emerges from the birth canal and crawls up its mother's body to the pouch, or marsupium, where it latches onto a teat and nurses for several more months. Infants first venture out on their own after two months. Red kangaroo joeys continue to return to the pouch for another six months, while gray kangaroo infants do not leave the pouch entirely until they are a year or so old. Female kangaroos are capable of simultaneously producing two types of milk to nurture both a joey that has left the pouch and a newborn.